RealTime Performance has assembled leadership development expertise and insights into an easy-to-use resource guide, "10X10: Charting Your Own Course – Tips and Resources to Develop Your Leadership." The tips and resources presented in the e-book are taken from the topics and resources available in Inspire, RealTime Performance's Web-based tool that empowers employees to take ownership of their career growth by enabling them to build, drive and track their own leadership development plans. Using these resources and insights, employees are able to quickly and easily identify strengths and weaknesses, create relevant and useful development plans, and engage in meaningful discussion with their managers about leadership development. Inspire connects employees with targeted activities and resources for learning, giving them the tools and information they need to drive their own professional development. "Despite the best of intentions, it's not always possible for managers and employees to sit down together and carefully craft individualized development plans," said RealTime Performance's chief executive officer, Sean Murray. "This e-book offers a glimpse of how Inspire enables employees to take charge of their own leadership development by providing the tools for their specific areas of need." 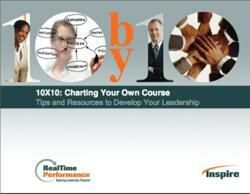 "10X10: Charting Your Own Course – Tips and Resources to Develop Your Leadership" is available now for complimentary download by visiting http://www.realtimeperformance.com/about/downloads_ebook_2012.html. Founded in 1999, RealTime Performance delivers online training products to develop company leaders. The products enable companies to cost-effectively assess leadership skills, make targeted recommendations for performance improvement and empower employees to create and share development plans to achieve business goals. The company's flagship Web-based training product, Inspire, provides a self-directed means for employees to manage their career development, giving them access to knowledge and skills at the "point of need." For more information, visit http://www.realtimeperformance.com.